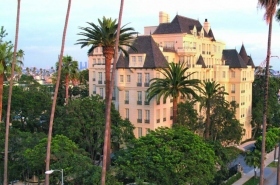 The Church of Scientology Celebrity Centre was founded in Los Angeles in 1970 at the direction of L. Ron Hubbard and with the assistance of the rapidly growing artistic community within the Scientology religion. Celebrity Centre provides Scientology religious services to artists, politicians, leaders of industry and sports figures while, like all Churches of Scientology worldwide, delivering the same services and remaining open to all. It focuses on providing the creative individual with a distraction-free environment where they may pursue Scientology spiritual counseling and courses. An accomplished artist himself, Mr. Hubbard long held that rekindling the artist spiritually enhances their creativity, restores high ethical standards, and otherwise helps the artist. Achieving their own spiritual goals, artists routinely channel their inspiration in ways which contribute to the spiritual uplifting of society as a whole, and Celebrity Centre supports and assists the artist who wishes to participate in social betterment activities. Celebrity Centre International coordinates the activities of a network of Celebrity Centres in world cultural capitals including Las Vegas, New York, Paris, Florence, Vienna and Nashville.